Joining in that spirit of generosity, for the THIRD year, is the Team from BCS Automotive (formerly TRW). These ladies host fund raising events from bake sales to spaghetti dinners and have raised more than $3000 over the past 3 years. Thank you to Carol and her hard working volunteers who help keep the mission of Team Vogel going. Help Team Vogel while you shop! Thank you to Tim and his crew for continuing their efforts to help in the fight against cancer. Click here to read about Tim's flight. Our volunteer-ran organization targets your donations to our applicants and to research and patient support. Since beginning in 2010, Team Vogel vs Cancer has provided financial assistance to over 130 families, to research and patient support, distributing over $370,000. ​•The ﻿APPLICATION﻿ FOR SUPPORT is available online. Click Application on the navigation menu above, and you will find the form and complete information for using it. 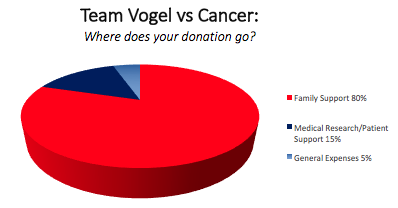 To make a one time donation to Team Vogel vs. Cancer, please choose one of the options below. Team Vogel vs Cancer is a 501(c)(3) nonprofit organization. Donations are tax deductible.